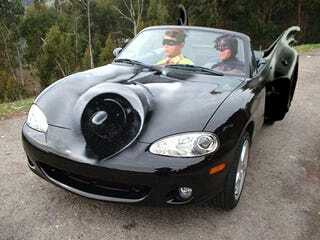 A precarious mix of unemployment, Mazda Miatas, and photoshop could produce many things. A man named Moe took these three conditions and created a borderline disturbing but also funny collection of homemade chops. He's got everything from an Army issue Miata to a Zoom Zoom Zamboni. Extensive televison viewing seems to have also played a role. Tom Selleck and Wonder Woman are in there, but sadly there is no Columbo Miata.